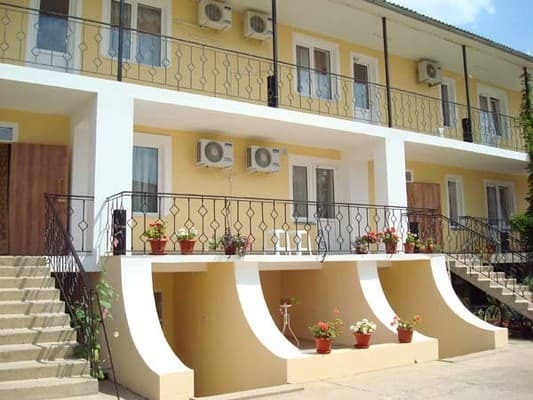 Pension "Galina" is located on the territory of the cooperative "Skif", 150 meters from the sea. There is its own pebble beach. The entire territory of the boarding house is guarded. 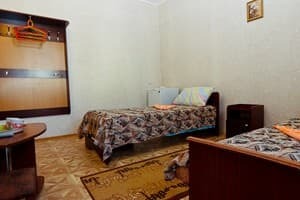 The hotel offers accommodation in 18 cozy rooms with all amenities: refrigerator, air conditioning, TV, bathroom (shower, washbasin, toilet). 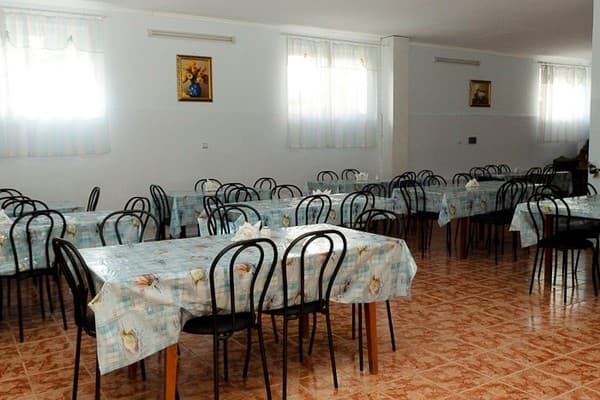 In the boarding house "Galina" there is a dining room that provides food for tourists. There is an indoor swimming pool with sea water, a children's playground, a gazebo, parking, free Wi-Fi. It is possible to organize excursions, transfer. 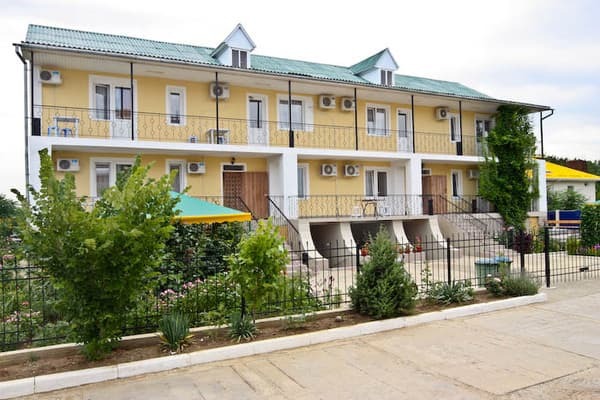 Pension "Galina" - an ideal place for family holidays, and for recreation with friends. The distance to Simferopol is 45 km, the airport - 60 km. PRICES MAY CHANGE, UPDATE INFORMATION ABOUT THE OPERATOR. Description of the room: Cozy room with all the necessary attributes for a comfortable stay: 2 single beds, wardrobe, dishes, loggia. 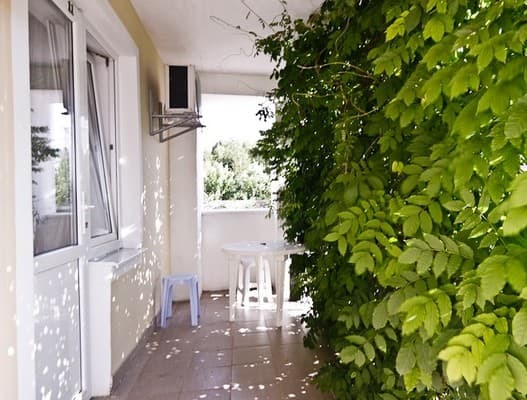 Description of the room: A cozy 1-room suite with everything necessary for comfortable living: a double bed or a sofa bed, a single bed, a wardrobe, dishes, a loggia. 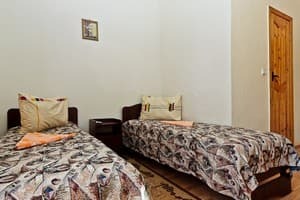 Description of the room: Cozy 1-room suite, which has all the necessary attributes for a comfortable stay: single beds, hangers, bedside table, dishes, loggia. 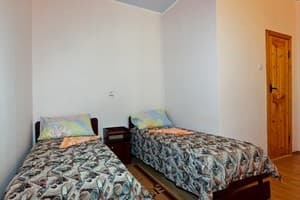 Description of the room: Two-room suite with all necessary attributes for comfortable living: balcony, refrigerator, air conditioning, dishes, TV, bathroom (shower, toilet, washbasin). In 4-bed and 2-room rooms, an extra bed is available (50% of the room rate). Pension "Galina" is located in the village of Nikolaevka in the territory of the "Skif" cooperative, 150 meters from the sea. The distance to the nearest grocery store and market is 100 m, to the bus stop - 50 m. The distance to Simferopol is 45 km, the airport - 60 km. From the railway station of Simferopol by shuttle. The journey takes 1 hour. You can order a transfer from Simferopol (for an additional fee).